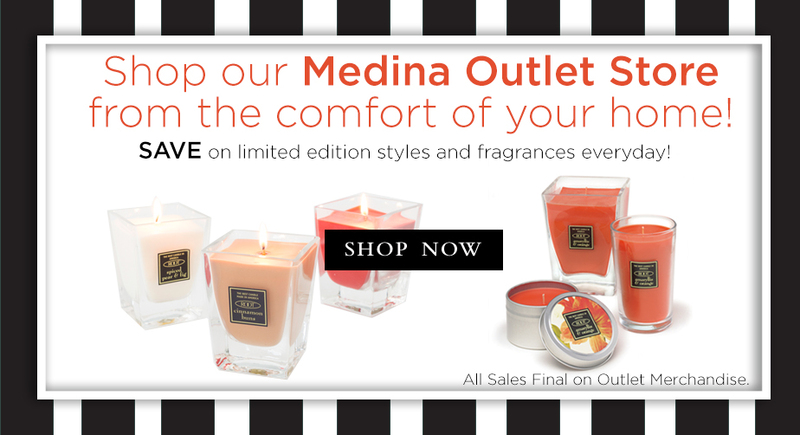 Shop our Medina Outlet Store from the comfort of your home! Medina Outlet merchandise consists of private label overruns, slighted blemished candles and discontinued styles, colors, and fragrances. Medina Outlet candles are sold without lids, labels, or gift boxes. Candles can be discolored and have "bloom" streaks throughout them. Burn quality is never compromised. All sales are final on Medina Outlet merchandise. Sale items are not subject to any further promotions or discounts unless otherwise noted.